Wanting to do a DIY overhaul of your ‘garden’ and grow a wild array of plants and veggies can be a complete pipe dream. Especially if you live in an urban two up, two down and you’re not Alan Titchmarsh or finely schooled in the art of D.I…whY? When Theon was 6 months old we made the decision to move (even further away from friends and family) to Bolton. The rent was cheaper and we knew it would help us to save enough money to put a deposit down on a house. 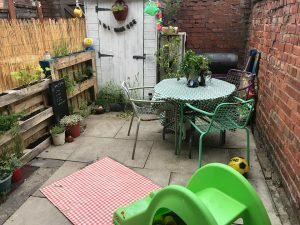 But, as most inner city dwellers know it’s practically impossible to have any form of functional, family outdoor space or dare I say garden! This is more so if you are renting on the cheap! 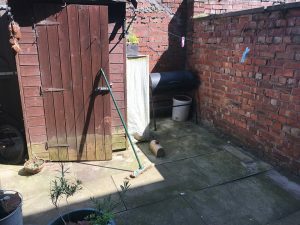 And this is what we got, a smallish, enclosed yard with a slightly worn out and extremely depressed looking shed. Outdoor space for us is so important. As is regular ‘ecotherapy’ for everyone and their mental health. As a family we had a four point criteria that we needed this make-over to fulfil. A play area for Theon. Especially while I was pregnant and with it getting more and more difficult to take Theon and his ‘push it’ (scooter) to the park every day. Even more so this year with the blinding hot summer we’ve had. 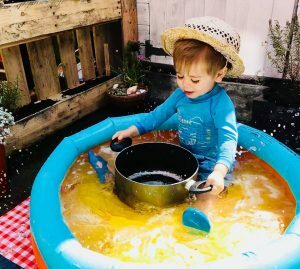 We needed space for at least a paddling pool – to cool off. And a slide – for burning off the toddler agg! As much as Theon was a huge driving force for us. We also needed some grown up outside space. As a family we often eat al fresco as Yianni is a huge BBQ-er. As for me, I love starting my day with a coffee outdoors in order to gather and re-centre myself. It needed to attract and house the local fauna. 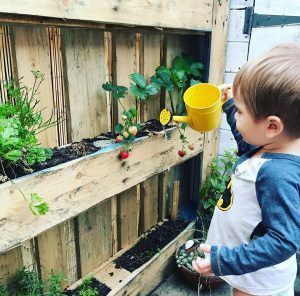 We wanted to show Theon how to grow veg and plants and the importance of even the smallest of insects. As well as brightening our environment with visiting butterflies and bees. It needed to be on a budget. The whole point of this house is to save money for our own investment, for a better future. We sourced pallets to use as wood for making planters, we made sure that the pallets we used were chemical free as we wanted to use them for growing consumables. Next we wrote to Grow Wild A UK initiative, passionate about native plants and fungi. Their main goal being to help people learn how to grow greener spaces. 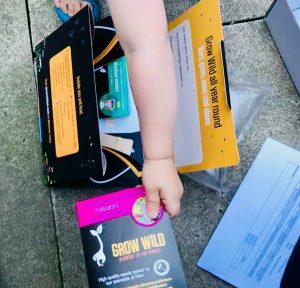 The Grow Wild team donated a huge box full of seeds indigenous to our North West area. Perfect for housing and feeding our busy, buzzy, buddies. And here it is. For less than £100 this is what we managed to put together, and we LOVE it! Colourful and a little rough around the edges (like us), this picture was taken before our ‘Junk Yard’ came into full bloom. Affectionately nick-named as everything in it (bar Theon’s slide) has been recycled and/or re-purposed, even the table and chairs were pulled from a skip! Want to see it in all its blooming glory and find out how to do the same, we’ve vlogged the process and all the fun we’ve had along the way, below. And remember it’s not how much you’ve got, but what you do with what you have. I’ve struggled living separated from my network of friends and family, especially as our own little family grows. Organising this outside space has improved our quality of life without blowing a hole in our budget. Look after yourself and your environment! Such a great age to get him into the garden! Looks nice , great idea the use of the pallets !! Total transformation , looks great and you guys must have lots of fun!!! Yeah it’s a really great, functional space now. I wonder if we can apply some of your ideas to our balcony! Definitely, you should maybe look at vertical space and stacking like the pallets we used. Super cool ideas for urban gardens! What a lovely use of the outdoor space! Fantastic use of the palettes, I might have to nab that for my garden! Thank u, Theon loves it!